But, over the years, I’ve made sense of it. I’ve got it now. In fact, since I’ve gotten it, I’ve flipped it into something more meaningful, for me, in my work. I was recently sitting in on an executive session kicking off the strategic planning cycle. I used the quote as I was making a point in the meeting. I am not at all sure I should have used it, because when I used it I used my flipped meaning and not the standard, widespread meaning. Back to the quote, and the strategic planning meeting. By most accounts, Robert Browning was talking about the notion of aspirations. 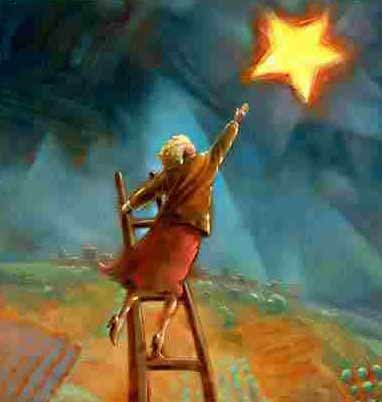 Reach for the stars! He was advocating for setting challenging goals. So conversationally it might be no, go for it, just don’t expect to get everything you go for! Heaven is where we get everything we want… If we accomplish everything we set out to accomplish, what is heaven for then? Now you might be thinking how in the world that notion would be relevant to share in a business strategic planning meeting. I don’t blame you, I would be thinking that too, if I intended to use that meaning. But of course my application wasn’t drawing on that meaning. For me, the crux of the matter is to focus — and work hard — on minimizing the difference between our reach and our grasp. Now I’m not suggesting we necessarily not reach for the stars. This to me isn’t an automatic we need to manage our expectations play, although that’s where it could land. No; for me, it is way more about increasing our capabilities, i.e. improving our grasp. In more business / OD-speak, it is about tweaking and syncing up the structure, policies, work processes, culture, talent… the plane will fly based on how it’s designed; shouldn’t we redesign when we want it to fly differently? I really don’t lose my patience that often. Really, I don’t. But there are times that test me, and one of those times is when I repeatedly see goals that are set with only perfunctory attention given to investing in building the organizational capability to reach them. This is a particularly acute hot button because I really can’t stand the predominant result of this — leaders pointing fingers and placing blame at people, and not owning the root cause of the underperformance — insufficient organizational design. Please don’t misunderstand; the strategic vision should be a stretch, it should challenge the organization to accomplish bigger and better in order to stay strong and competitive. Because it is the result of strategic thinking, a strategic vision can inspire, and energize. It can motivate to reach. But strategic visions need to incorporate comprehensive strategic plans that emphasize building the requisite organizational capability. These plans raise confidence that the strategic vision is realizable. These plans strengthen our grasp. But wait, one last thing. Let’s look one more time at that quote. Ah, but a man’s reach should exceed his grasp, else what’s a heaven for? What could that “Ah” mean? Offering up an enthuesiastic AMEN!